The new Six Star® CreatineX3™ is from themakers of MuscleTech®, so you know it’s a premiumformula you can trust. Unlike the competition, Six Star CreatineX3features a clinically proven, 8,000mg mega dose of creatine and 30%more creatine per serving. Six Star® CreatineX3™also has less carbs and sugar than the competition! Six Star® CreatineX3™ boosts muscleperformance when it really counts by helping an athlete’s bodygenerate ATP, a primary source of energy used during high-intensitytraining. You’ll also experience more muscle size and strength. 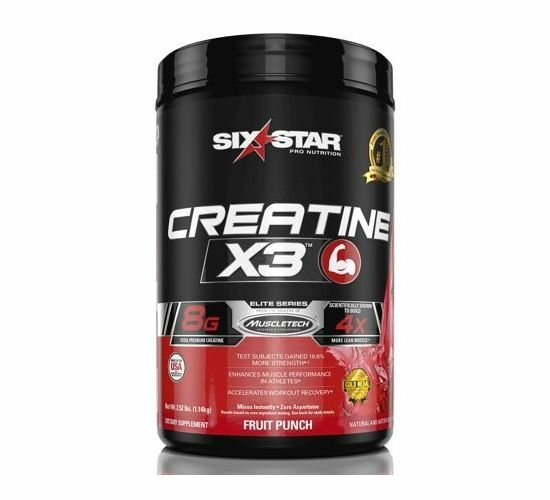 Six Star® CreatineX3™ features aspecialized, short-chain carbohydrate that rapidly converts toglycogen, to help replenish depleted levels after a workout. Theformula is so cutting-edge, Six Star researchers protected it withmultiple patents. In a 10-day study conducted at Ohio State University on 31weight-trained test subjects randomly assigned to one of threegroups, subjects consuming the same form of creatine found in SixStar® CreatineX3™ with a training programincreased their strength capacity on the bench press by 18.6%compared to baseline (6,658 vs. 5,613 joules). Testing was performedusing 70% of the subjects’ one-rep max bench press.